When teaching others how to knit, a men’s prison is not the location that first comes to mind. After working for 18 years, Lynn Zwerling spent her time as a retiree sharing her knitting passion with male convicts in a Maryland prison. Being that knitting is calm and soothing, she believed the convicts would benefit from learning how to knit. Although many prisoners were hesitant in the beginning, they quickly became passionate and attached to knitting. Zwerling taught them how to knit comfort dolls for children who were removed from their homes due to domestic abuse. Along with dolls, the convicts knitted hats for children in inner-city elementary schools. 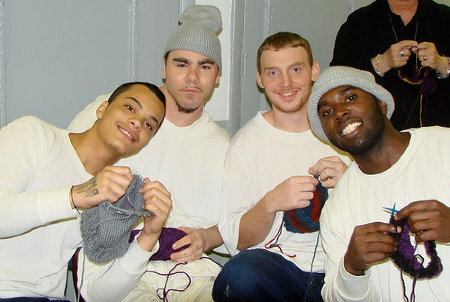 Many prisoners believe that the knitting program, Knitting Behind Bars, helped them get onto parole and stay out of trouble. If you are looking for a way to give back to the community be sure to check out Afghans for Afghans. This organization sends hand-knit and crocheted blankets and clothing to men, women, and children in Afghanistan who have suffered from the war, sickness, and poverty. Your support would be greatly appreciated by those who benefit from afghans for Afgahns. Be sure to check it out!